645 Posts (and counting) on Eastern Europe! The Iron Curtain no longer exists, but its legacy does. Eastern Europe has an identity and a culture very different from the rest of Europe. Attempting to escape from a tortured past, but forever being influenced by it. This blog deals with and discovers a region stuck in limbo between East and West. I was running through the old historic quarter of Marseilles, Le Panier. Following the twisting and turning streets I climbed stone stairways and then just as quickly plunged back down another set of steps again. I lost my way, rounding what seemed to be a thousand corners. I followed quaint, cobbled paths through narrow passageways to nowhere in particular. At times it felt as though I had covered every street, every alleyway, every impasse and every square Le Panier offered, but then I would suddenly realize a new route or perhaps an old one I had misremembered. Everything looked different and alike all at once. 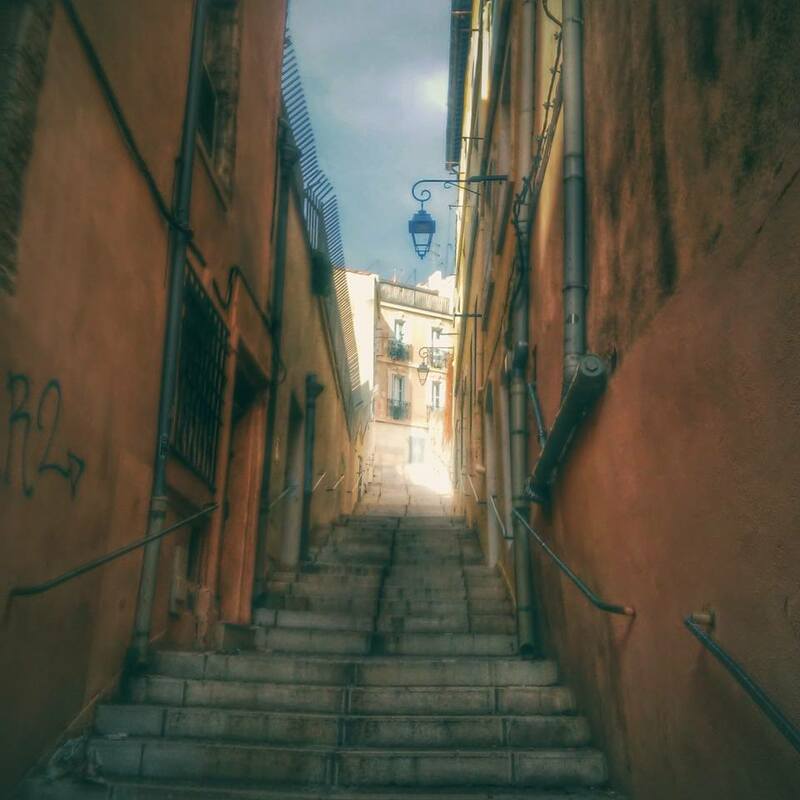 I spent much of the run in a blissful confusion, lost in the maze of Old Marseilles. Then suddenly something squished beneath my right foot, transporting me back to the present. Looking down I noticed a fat, fleshy rat, lifeless and rubbery. I leapt in a sudden fright. I had stepped on a large dead rat. I noticed another one nearby. My pace quickened as I hurried away, turning at the next corner. Then the fear left me as quickly as it had arrived though the experience was embedded in my memory. Le Panier may have been quaint, cozy and historic, but in the early morning it was also pungent and dirty, covered with the residue of late night activities. From this a scent, a sight, a hint of the past came to me. A reminder of what Marseilles was like for more centuries than I could possibly imagine. Centuries past when a lack of hygiene brought deadly diseases that laid the entire city’s population waste. Death was sometimes brought by ships unknowingly transporting a lethal cargo, which would then lead to a dreaded plague. 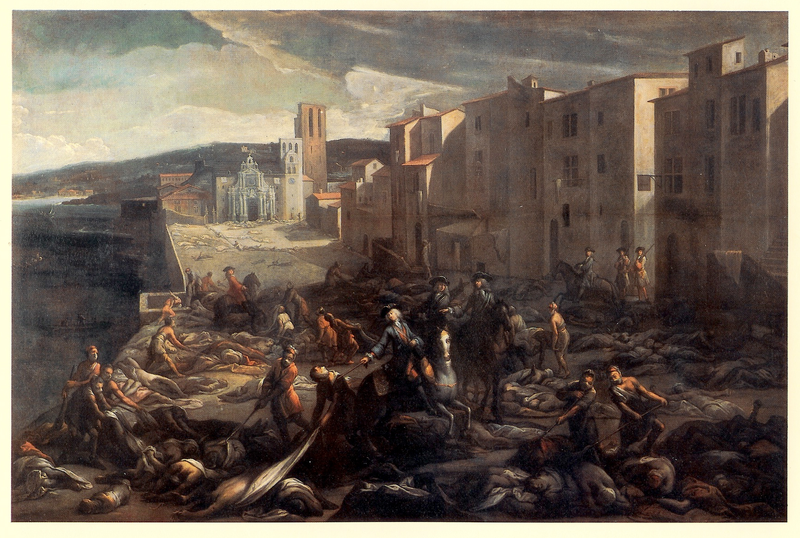 The worst outbreak to hit the city was also one of the last major plagues in Europe, devastating the populace from 1720-1722 during what came to be known as the Great Plague of Marseilles. On my last day in Marseilles I was walking back from Fort St. Jean toward the Vieux Port (Old Port) area. During that short, pleasant stroll along the Quai des Ports I suddenly came upon a long stone building. The structure had obviously stood the test of time and could rightly be termed “historic.” While studying the building I came across an information sign in French. Instantly I recognized the word “quarantine.” Then it dawned on me that this building had been a make or break point for any ship that wanted to enter the port of Marseilles. The building had once held the power of life and death over the city, both economic and biological. Such structures were part of lazarets, quarantine facilities such as buildings or islands for seafaring crews and cargo. Captains would enter the building to present their ships’ manifests. These would be carefully studied by personnel who worked for the city’s sanitation board to make sure a ship did not transport a dreaded disease to Marseilles. If anything was found that constituted a threat to public health, the ship would be turned away. Conversely, if the ship was given a clean bill of health, then it would be allowed to enter the port. The consequences of each decision on whether to allow a ship to pass into the port or not were huge. The ships bringing goods to or from the port were the lifeblood of commerce for the city. Ironically, these same ships could bring untold devastation. That stone building along the Quai des Ports is one of the few physical remnants left of the quarantine system setup to protect Marseilles from the plague. The system was a response to a deadly outbreak that struck the city in 1580. The quarantine consisted of three tiers that would scrutinize and confine the cargo and crew of every ship that arrived in the harbor. Any hint of plague uncovered during an inspection would result in the ship being isolated at an island well outside the harbor. Captains also had to present detailed logs to sanitation officials. These documented each city their ship had visited prior to arrival in Marseilles. If one of those cities was known to have had an outbreak of plague, the ship would then be confined to the second part of the quarantine system with facilities on another group of islands just off the coast of Marseilles. The crew, along with their ship, would then be forced to wait for several weeks. If no signs of plague were found then entry would be allowed. Even ships deemed disease free would have to wait for two and a half weeks before they could enter the port. The quarantine system did a good job of protecting Marseilles from plague for well over a hundred years. Then in the early 18th century the system suddenly broke down as pressure from commercial interests led to a sidestepping of the usual regulations. This proved to be a fatal mistake. In 1720 a merchant ship, the Grand-Saint-Antoine, was sailing around the eastern Mediterranean making multiple ports of call. In Syria and Lebanon the ship took on fabrics and cotton that were likely contaminated with the plague bacillus Yersina pestis. This was the same extremely virulent form of plague that had caused the infamous Black Death in the 14th century. While the Grand-Saint-Antoine was traveling to Cyprus in early April, a Turkish passenger on board died. His body was thrown into the sea, but soon thereafter several crew members also succumbed. At the northern Italian port of Livorno the ship was denied entry. When it arrived on May 25th in Marseilles it was immediately put into quarantine. A decision was then made that the ship and its cargo should be sent to a nearby island. That decision would soon be changed. 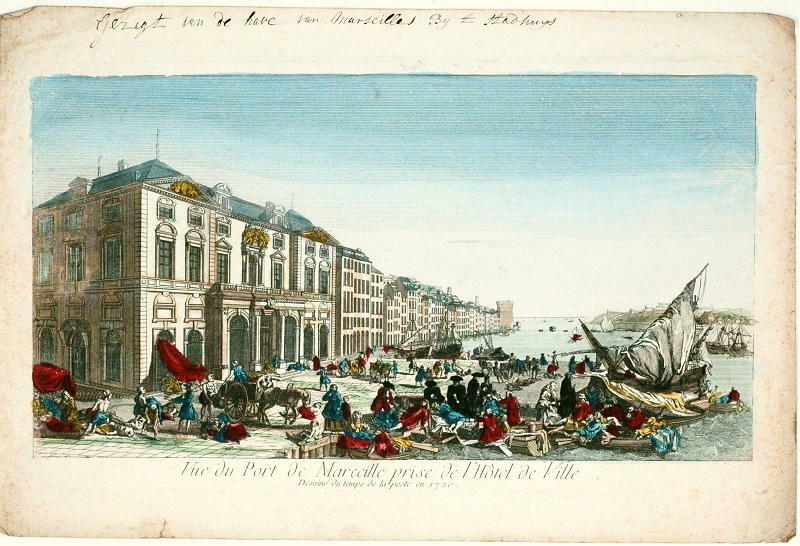 The wealthy commercial interests in the city wanted the silk and cotton offloaded. 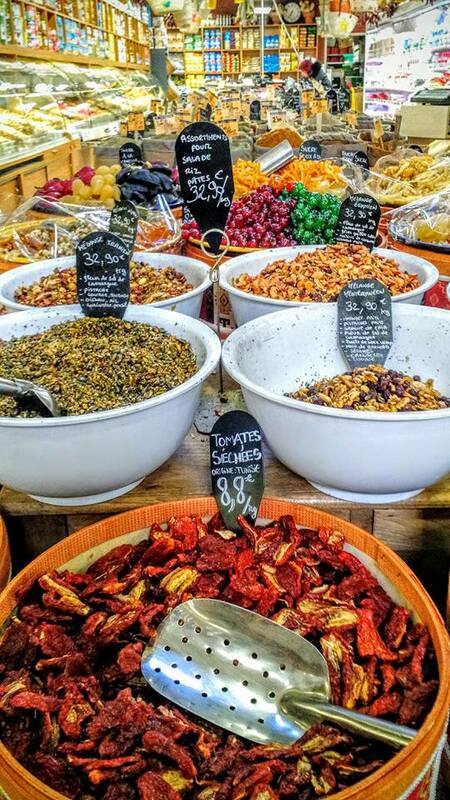 A popular trade fair was due to take place at the town of Beaucaire in July. Getting the ship’s valuable cargo in the hands of powerful merchants took precedence over the imminent danger of plague to the inhabitants of the city. Thus the cargo came ashore and with it the plague. Exactly a month after the Grand-Saint-Antoine had first called at Marseilles, several porters who had offloaded bales of cotton died. These were the first of tens of thousands of deaths to come, not only in Marseilles, but also Provence. One of the last great outbreaks of plague in Europe was underway. It was supposed to be dangerous and beautiful, seedy yet enchanting, full of life as well as a place where you might fear for your life. This was what I was led to believe before traveling to Marseilles, that gritty, idyllic French city that rises from the dreamy blue shore of the Mediterranean. My initial impressions helped peel back the multi-faceted layers that make up Marseilles. Everything I had read and researched beforehand turned out to be true, but there was so much more. It may be France’s second largest city, but Marseilles is rarely mentioned in the same sentence as Lyon, Nice, Strasbourg, Bordeaux or Toulouse, let alone Paris. It ranks low on the list of destination cities for visitors to France. That is odd because regionally Marseilles is often included in two of the most attractive and well-known tourist destinations in the world, Provence and the Cote d’Azur. While it might be included as part of these, the city really stands apart. There is nothing like it in France or for that matter, the world. It is an urban conurbation that size-wise is even larger than Paris. From the perspective of cultural geography the city is a contradiction. Marseilles is in France, but only partly of France. It is more a Mediterranean than a French city. It has a grittiness that is reminiscent of Eastern European cities, but a grandeur that is unmistakably French. Though it is geographically in Western Europe, much of the eastern aspect that gives the city such a distinct identity washed onto its shores via a port that ranks as the 8th largest in the world. Due to the fact that topographically it is hemmed in and segregated from the interior of France by hills, Marseilles has looked southward to the Mediterranean for its economic and cultural life. Over the past couple of hundred years Jews fleeing anti-Semitism, Italians fleeing poverty, Armenians fleeing genocide, Spaniards fleeing fascism, Algerians, Tunisians and Moroccans fleeing poverty all came to Marseilles seeking refuge, wealth and most importantly, a new start. This has made the city a mélange of cultures, with French culture leaving its imprint on them all. Marseilles does not suffer nearly as much segregation as other French cities. The dividing line between rich and poor, upper middle class, working class and low brow had often been blurred. Fortune and misfortune rub elbows on a daily basis. From the Vieux Port (Old Port) area inequality and the vicissitudes of fortune radiate outward. Beggars and bankers side step one another along the city’s main boulevard, La Canebiere. A couple of blocks away glittering Zara-esque storefronts sparkle while a homeless man lurks one doorway down. Haute couture fashion shops stand along un-swept streets as high heels and cigarette butts share the same sidewalks. Then the visitor suddenly arrives at the Arab Market, an ascent or descent into another world depending upon one’s perspective. It is an all-out assault on the senses. Here the Maghreb meets Marseilles. French gives way to Arabic, the skin of its merchants is a delicate, pale brown, noise and energy proliferate as do crowds of hawkers and gawkers. A bit further onward from the market are streets filled with all the disparate and desperate forms of life. Storefronts indicate the minority cultures that have found a home here. Afro-hair extensions on offer, men standing in doorways watching, talking and waiting for a living, a decadent, exuberant dynamism can be felt in every alleyway and rubbish strewn street. Darkness lurks in daylight as crime seems to be around every corner, but such a feeling is fleeting. It is loudly contradicted by the vibrancy and variety of life to be discovered amid these pulsing streets. The area is fraught with ambiguity, an Arabian France, where friendliness and danger are to be felt in equal measure. Here is the kind of place that can make almost anyone feel foreign. The outsider imagines the worst. And the worst turns out to be less than imagined. In my case it happened to be a young man who tried to short change me out of one euro over a bag of jellybeans. He smiled politely, while his eyes attempted to evade mine when I called him out for his petty attempt at crime. A bit further out from the city center Marseilles crawls away from the Mediterranean scaling the hillsides. Steep streets defeat even the most vigorous urban hiker making their way through the 6th arrondissement to the city’s highest hilltop. Hundreds of steps lead to precipitously inclining pavements. They then merge into yet another set of steps. Directional signs lead the way through a withering array of twists and turns to the highest hilltop in the city. The tourist fails to notice that they are striding past the more refined, upper middle class Marseilles. Dirty white and sea foam green shutters cover large windows. Homes are hidden by large walls or gates, with every entry point requiring a code. A rage for privacy pervades these silent streets. The bark of dogs is heard much more often than voices. People seem to live here, but they are rarely seen. 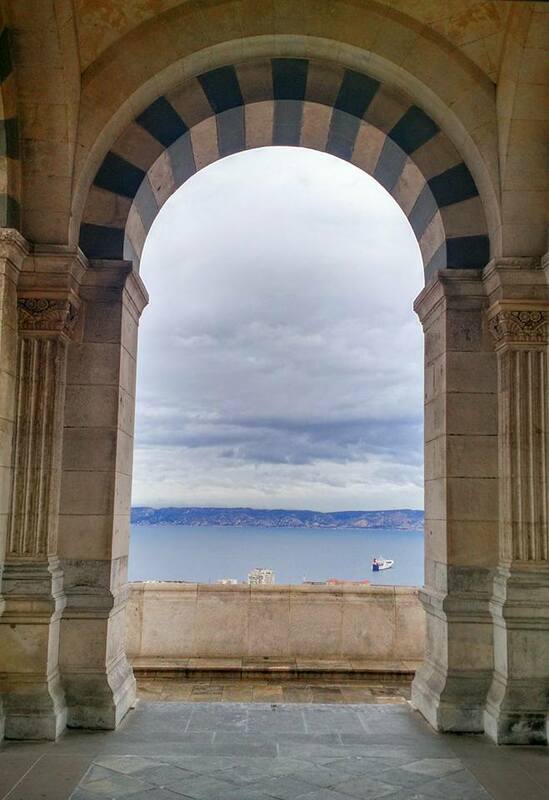 The architectural achievement that crowns the heights above this neighborhood and the culmination of many a visitor’s itinerary is the Notre Dame de la Garde. It can be glimpsed in fits and starts on a trek to the top. Disappearing and then reappearing in bit parts, always a false summit farther away. The irony of this faraway so close feature of the church will not be lost on the hunchbacked pilgrim plodding up to these heights. From many miles away in the city the church can be seen soaring prominently skyward. Then as one begins to make the lung bursting ascent it disappears completely from view. On faith, the pilgrim must follow signs and steps and stairs until they arrive with their forehead frothing with sweat just beneath the church’s towering presence. It is at this point that the pilgrim’s heart must fall. 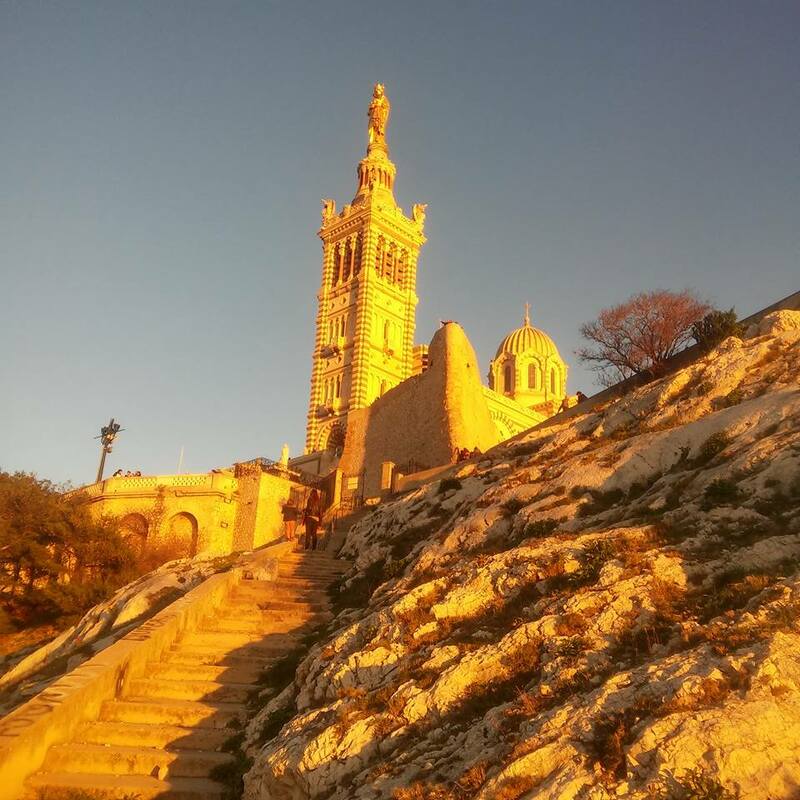 For all their climbing, they must suddenly realize the Notre Dame de la Garde reaches heights that can never quite be reached. The gold Madonna that tops the church seems to reach the heavens. Glancing back from just outside the church reveals a panoramic view of the city, its buildings glowing white and luminous, looking like a mirage. This could only be Marseilles.